This one has been a long time coming. We’re finally seeing an update to [Jaromir’s] retro gaming platform based around and ATmega chip. The thing that was novel about it back in 2009, and continues to be to this day, is the use of VGA output (PAL) from an AVR chip rather than composite video like most offerings. Good projects never die and recently he picked the hardware up again, spinning a mostly surface mount board and putting together a new website to feature his work. Above you can see a demo of Commander Keen 4 running on the hardware (video below). He’s also has a rather trippy Super Mario port and adapted [Albert Seward’s] PacMan source for the hardware. The chip is being clocked at 32MHz with VGA clock running at 19.6608 MHz. This gives him sixteen colors with a resolution of 192×144. He concedes that you get better resolution out of composite video, but who needs resolution for retro gaming? The 2013 Uzebox Coding Challenge is currently underway. This competition runs until June 1st, with registration open until April 1st. The Uzebox is an open source, 8 bit game console that uses only two chips: an ATmega644 microcontroller and a AD725 RGB to NTSC converter. We’ve featured it a few times in the past. The competition rules are pretty loose: build a game or a useful piece of software that runs on the Uzebox, and fits in 61 kB. Entries will be judged on game play, originality, graphics, sound, completeness, and technical prowess. There’s prizes for the top six entries, including a few Uzeboxes and cash. If you don’t have an Uzebox, check out the Uzem emulator. This lets you emulate the Uzebox hardware on Windows, Mac, or Linux. The emulator also has an internal GDB debug server to help with development. The low cost console can be built for about $30, and a number of kits are available. Thanks to [Ben] for sending this in. Looks like Redbull is harnessing the power of open source hardware to market their product to hackers everywhere. We’d say that it worked because here we are, posting up some free advertising for them. It seems that a rep for the company dropped off a package at a hackerspace in LA called Null Space Labs. It came in what is obviously a laser cut wooden box, a material that tends to make hackers salivate. Inside they found the board you see above. It took a bit of time to look over the hardware was eventually identified as an Uzebox. Sure enough, then plugged in an original NES controller to the controller port on the back of the board and were playing a version of Pac-man in no time. Marketing and advertising have their place in our lives which can be annoying and intrusive at times. But we have no problem with it when done creatively and targeted to our interests. 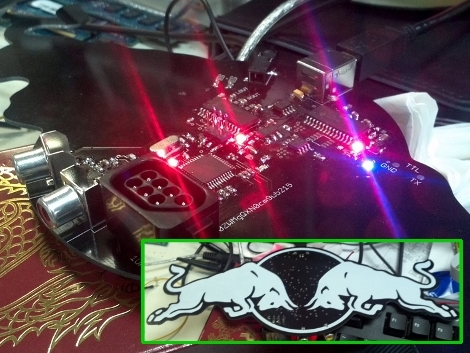 Good job Redbull, and might we add, that’s a heck of a routing path for your PCB outline! [David Cranor] has managed to fit a fully working Uzebox system into an old NES controller. Uzebox, an open source gaming platform based on the ATmega 644 and an AD725 NTSC encoder, is one of a couple systems that are becoming more and more widespread and accessible. There are a number of ready-to-go Uzebox kits available, but for the more hands-on types, [David] has been very generous with his schematics and step by step instructions. These schematics can all be readily reshaped, and would easily fit into controllers with less fun applications and sentimental value. Everyone’s favorite open source game console, the Uzebox (also cloned as the Fuzebox), just got a new feature hacked into it – a video player. At reduced quality (8-bit color), the Uzebox was able to play ‘The Matrix’ off an SD card @ 30fps plus the audio @15kHz. That’s a pretty impressive feat when one considers it is running on 4096 bytes of RAM. The video file had to first be converted into a series of pictures through a Photoshop macro in order to be playable. A Uzebox can be built with little more than a few resistors in addition to an overclocked ATmega644P, and AD725 (which has been skirted in certain incarnations).